IZ Beauty Of London have the perfectly proportioned bottles of nail lacquer, the design is edgy and shows the brand's commitment to producing and creating unique, professional products. 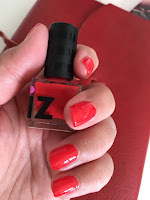 IZ nail lacquer gives the gel effect finish to nails without the need of UV equipment. The very rich consistency contains a patented plasticiser to reduce the risk of chipping and add to the superior gloss finish. The application is easy with the short handle and curved brush, and two coats gave me the perfect finish. Ideally sized for travel, 6ml of compact colour for £6, IZ have certainly nailed it. Immediately Hot Chilli leapt out at me, red!, of course, I would head to this first. A glorious orange-red, this gives a perfect look to nails of all lengths and will certainly stand out if you catch a few rays and develop a tan. The colour of summer, the consistency is quite thick, yet, easy to apply, the nail feels as though it is being coated and not just having colour brushed across it. Inky Blue, is the perfect stormy sky in a glass bottle, a strongly determined blue that clings to nails giving depth and drama. I loved the tranquil appearance of one coat, it varied in tone, two coats and it was the exact match of the colour in the bottle. Three coats and it looks deep, there is a heaviness about the shade, I like the option of not always going for bright and it looks good when you wear a lot of blue, as I do, the whole look is brought together. There is no feeling blue with this Inky choice. Get Plumped, the most wonderful name and a perfect option to use as a top coat to take the gloss finish already achieved to an even higher level. I also like this for a simple finish to the nails when I have a break from a colour lacquer but want them to at least look presentable. A little pot of gloss to plump the nails and give the perfect finish to colour or plain nails. IZ Beauty Of London certainly has nailed the salon look that is easy to apply at home. Gloriously glossy, superb colour choices from pastels to bold shades, these lasted through many chores without the sign or chipping or peeling, 6ml of lovely lacquer for £6. IZ does have the answer when it comes to nails.